(Phys.org) —A research team with members from Johns Hopkins University Applied Physics Laboratory and the US Geological Survey has concluded that hydroxyl molecules found in the central peak of a crater on the moon indicates that the moon likely had a water component when it was first formed. In their paper published in the journal Nature Geoscience, the researchers suggest that because the rock in which it was found likely came from deep within the moon, it's not likely the hydroxyl was formed by solar wind flux or by other bodies striking its surface. Bullialdus Crater is on the near side of the moon, situated near the rim of the much larger impact basin. At the center of the crater is rocky material that was pulled to the surface as the result of an impact, forming a peak. The team looked at data from M3 and Lunar Reconnaissance Orbiter Cameras available from NASA's planetary data system, which allowed them (via spectroscopic readings) to detect the presence of hydroxyl molecules—which is considered to be a sub-structure of water molecules. This is not the first time hydroxyl has been seen on the lunar surface, of course, but other instances have been attributed to deposits created by interactions between solar wind flux and minerals on the surface or from other bodies that collided with the moon. 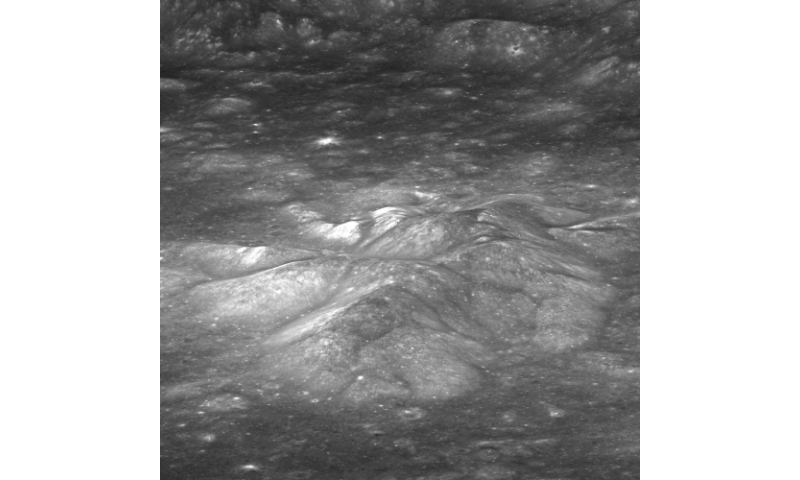 Prior research has shown that when hydroxyl is created or deposited on the moon, it generally sticks to cooler parts of the surface and moves as the temperature changes—the hydroxyl molecules found in the craters central peak, however, do not move, indicating they are embedded, which the researchers interpret to mean that they were part of the rock that was pushed up from below when the crater was formed. They also noted that there was no evidence of hydroxyl anywhere else near the crater. The researchers theorize that the impact that created the larger impact zone likely caused material to be pulled from deep within the moon and deposited nearby. The subsequent impact that caused the creation of the much smaller Bullialdus Crater, then caused material that had been spewed by the larger impact to be pulled to the surface of its central peak. And that material, the team concludes, likely included water. Once considered dry compared with Earth, laboratory analyses of igneous components of lunar samples have suggested that the Moon's interior is not entirely anhydrous. Water and hydroxyl have also been detected from orbit on the lunar surface, but these have been attributed to nonindigenous sources, such as interactions with the solar wind. Magmatic lunar volatiles—evidence for water indigenous to the lunar interior—have not previously been detected remotely. Here we analyse spectroscopic data from the Moon Mineralogy Mapper (M3) and report that the central peak of Bullialdus Crater is significantly enhanced in hydroxyl relative to its surroundings. We suggest that the strong and localized hydroxyl absorption features are inconsistent with a surficial origin. Instead, they are consistent with hydroxyl bound to magmatic minerals that were excavated from depth by the impact that formed Bullialdus Crater. Furthermore, estimates of thorium concentration in the central peak using data from the Lunar Prospector orbiter indicate an enhancement in incompatible elements, in contrast to the compositions of water-bearing lunar samples2. We suggest that the hydroxyl-bearing material was excavated from a magmatic source that is distinct from that of samples analysed thus far. Since this is part of the impact rebound, could this not have been "embedded" by the object that hit? I'm sorry but why exactly would that matter? Whether water was there when it was formed or came from comets it would have been completely inhospitable for life. The embedded hydroxyl was more likely deposited by the arc discharge that excavated the crater. I'd say equally as likely it's a bite mark from Omnipotus. It's a footprint from a giant TROLL. They aren't looking for signs of habitability. They are just working out how the moon might have formed, and what it was like in the past. They aren't talking about water on the surface at any time, as the moon would have been entirely molten for a long time after it formed. If people ever hope to live on the moon, it is going to be important for us to understand the geology there, and to know what we might be able to mine for. Even a small amount of water chemically bound in the rocks could be useful, but we would need to have some idea of how deep it might be found, and what form it is in. We might even find reservoirs of water ice deep under the surface. @FM: Central peaks are always derived from the convergence of the rebound flow, AFAIK. They indicate that the impactor was traveling at so called hypervelocity, i.e. faster than the sound velocity in rocks. Then the impact energy and material tries to move with a shock wave instead of coupling efficiently into the rock and showing the rock aside. The result is that the impactor is mostly vaporized by the released heat. When you look into unweathered typical impact craters, what you see is the original crust. The roughly same amount of mantle water as Earth (within a few orders of magnitude) is interesting because it is predicted as the outcome of the Tellus-Theia collision that formed Earth and moon, and more generic as the outcome of protoplanetary disk formation - Mars has also much the same water content. I know it is a strategy by trolls to look like they are short a head. Pity in this case that the result looks exactly like he has electrocuted himself!